Ask fellow campers about "Potlatch State Park" and nearby attractions. 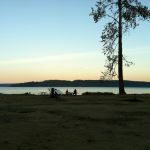 This campground is directly on Highway 101, on the side opposite the Bay, so you have to cross the highway to go to the beach and day use area on the Hood Canal. Obviously, road noise is also a problem. I was happy to have a full hookup site, but hookups are at the back of sites, which does not make the sewer hookup very convenient to use. Sites are small and crammed together. In addition, the roads are dirt, as are campsites, so dust is a problem, especially because several houses also use the park roads for access. I had to keep my windows closed and air conditioning on because of the dust from the cars going by in front of my site. Verizon is decent, but I don't know about other carriers. Because of the large trees, there are no sites where you can get satellite access. They really need to pave the roads to cut down on dust and provide separate access for houses. We camped at Potlatch State Park in a Motorhome. This is a small State Park in the Olympic National Forest system. There are 37 campsites, of which 18 are utility (30/50) sites, 17 are tent sites, and 2 are for bikers/hikers. This park does not take reservations, it's first come, first serve. It was August, mid-week (Wednesday), and I arrived around 11:00 AM. Campground was half-full, with only a few utility spots available. By Thursday, it was full (and kind of noisy!!!)! The camping spaces are "crammed" together. There are lots of trees for good shade, but you can still look out your window and wave to your neighboring camper. Some of the utility slots are back-in, and some are "half-circles" (try "bending" your RV around that slot!). If your RV is larger than 30 feet, you may not fit in any of the utility spaces, let alone trying to get into them! The driving road through the camping area is narrow and runs up and down hill in a circle with sharp curves. I had a back-in spot, but trying to back in was laborious. Fortunately, a very nice young boy from the neighboring camping spot offered to help me get in. The utility sites have an adequate place to pitch a tent next to your RV, and a fire-pit and picnic table. TV reception via antenna is adequate, not perfect, but adequate. There are hiking trails, and there is a beach across the highway. Next door to the park is a public RV resort with a laundromat, but I'm not sure if you're "allowed" to use the laundromat if you are staying at the State Park. I stayed two nights. If you leave your windows open while sleeping, you will hear the traffic on US Highway 101, even at 3:00 AM! We camped at Potlatch State Park in a Motorhome. Are you affiliated with Potlatch State Park ?